The evangelism team attended the “Violence Against Women Protest,” a largely anti-capitalist, anti-men, anti-American rally that made their case known by shouting, screaming, yelling and shrieking. The only thing they were for was the murder of the unborn. God gave me the presence of mind to pack about three hundred 180Movie DVDs before the event and another 600 pro-life tracts that are disguised as World War 2 Trivia. Then we hijacked the protest. 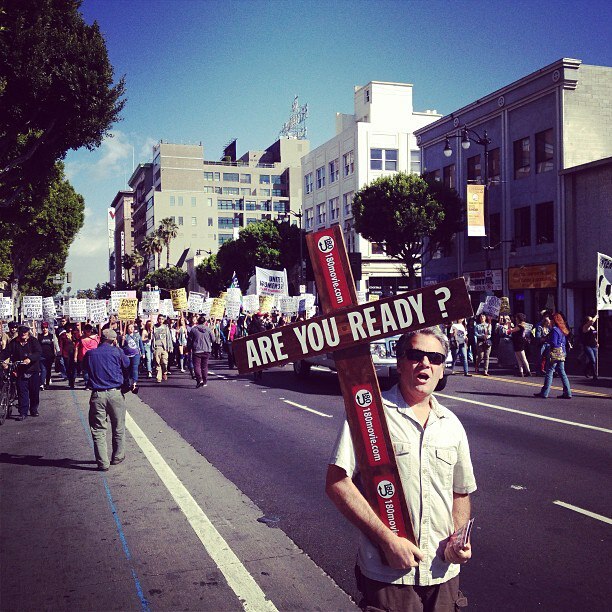 I walked fifty yards ahead of the angry mob who chanted their “Womens’ rights” slogans while carrying a cross. I decided to affix the 180Movie.com stickers to the cross when I noticed many photographers—probably from alternative publications—shooting me and the rest of the team as we held it up high. A baby woman’s right to live. stood up for the unborn by clicking here. And all those protests have shouting screaming people. The protest was probably related to the Violence Against Women Act, which Congress was wavering on keeping. You act like this is some kind of man-hate gathering, which is patently ridiculous. Why would congress pass an act called ” Violence Against Women Act”? Congress is for violence against women? Those jackasses. Steve, maybe I’m wrong, but haven’t you expressed consternation when someone has “hijacked” one of your videos, like the famous “atheist video” of yours? No, not at all. I loved that they did that. The Gospel was proclaimed 4x to almost 400,000 people. The issue of life is so important to me, that the subtle cross-bearing and tract distributing was necessary. Your standard of success is so low. “The Gospel was proclaimed 4x to almost 400,000 people”. It’s like musical chairs where there twice as many chairs as players. Success is measured by the preaching of the Gospel. So once again, you are mistaken. Yes, Steve, I know that your standard is the preaching of the Gospel. That way who don’t have to worry about who actually becomes a Christian. It keeps your batting average up.